The Fry Street Quartet is a set of truly remarkable musicians that knows no boundaries. The quartet’s work integrates a global perspective into new projects while nurturing the classical pillars behind today’s repertoire. This award-winning ensemble (including the Fischoff Competition Grand Prize, one of the crown jewels in the chamber music pantheon) is now an established quartet at the highest artistic level. 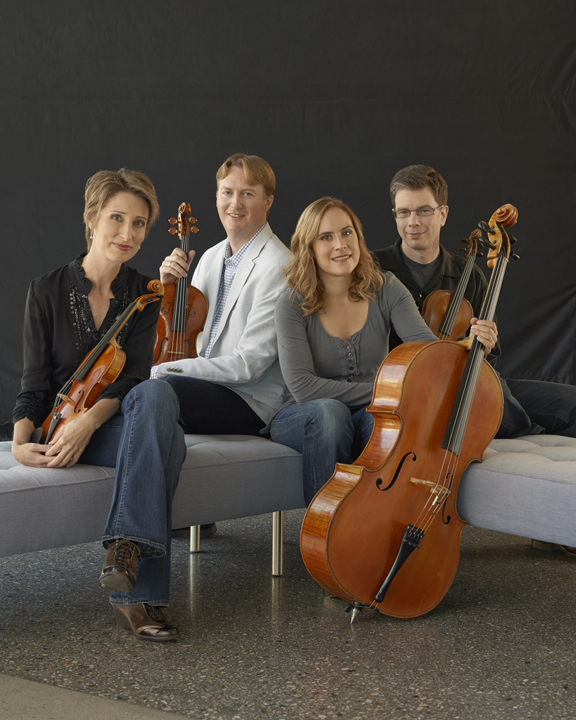 The Fry Street Quartet’s 2018 summer festival season included residencies in Berkeley and Chautauqua, and continues with a return to the recording studio followed by a debut tour of China. This remarkable quartet – hailed as “a triumph of ensemble playing” (The New York Times) – is a multi-faceted ensemble taking chamber music in new directions. Touring music of the masters as well as exciting original works from visionary composers of our time, the Fry Street Quartet has perfected a “blend of technical precision and scorching spontaneity” (The Strad). 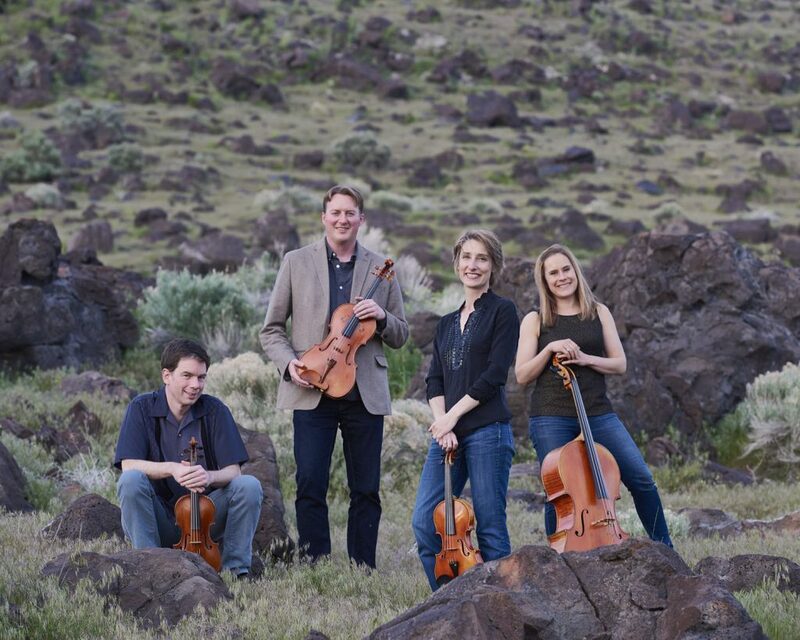 Since securing the Grand Prize at the Fischoff National Chamber Music Competition, the quartet has reached audiences from Carnegie Hall to London, and Sarajevo to Jerusalem, exploring the medium of the string quartet and its life-affirming potential with “profound understanding…depth of expression, and stunning technical astuteness” (Deseret Morning News). The FSQ’s tour repertoire reaches many corners of the musical spectrum, including works of Britten, Schubert, Beethoven and Bartok, as well as programs of American women composers Laura Kaminsky, Amy Beach, Joan Tower and Libby Larsen. 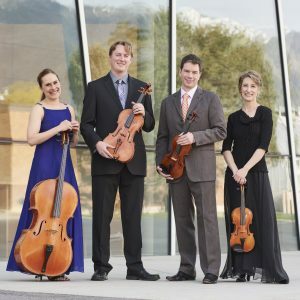 Over the current two seasons, the Salt Lake City-based NOVA series will present the FSQ’s complete Bartok Cycle, pairing these monumental works with Haydn’s String Quartets Op. 76. In addition to collaborations with acclaimed instrumentalists (including Joseph Kalichstein, Wu Han, Paul Katz, Donald Weilerstein, Misha Dichter, Andres Cardenes and Roger Tapping, among others), the Fry Street Quartet has commissioned and toured new works by a wide range of composers. Pandemonium by Brazilian composer Clarice Assad received its Fry Street premiere with the San Jose Chamber Orchestra; Michael Ellison’s Fiddlin‘ was co-commissioned by the Arizona Friends of Chamber Music Series and the NOVA series; Laura Kaminsky’s Rising Tide was commissioned especially for the quartet’s global sustainability initiative, The Crossroads Project. After dozens of performances in three different countries, Rising Tide: The Crossroads Project continues to resonate with audiences. [Video link] This fresh approach to communicating society’s sustainability challenges draws upon all the senses with a unique blend of science and art, and has been featured on NPR’s joe’s big idea (aired during All Things Considered), as well as in publications by Yale Climate Connections, Reuters, and the New York Times. 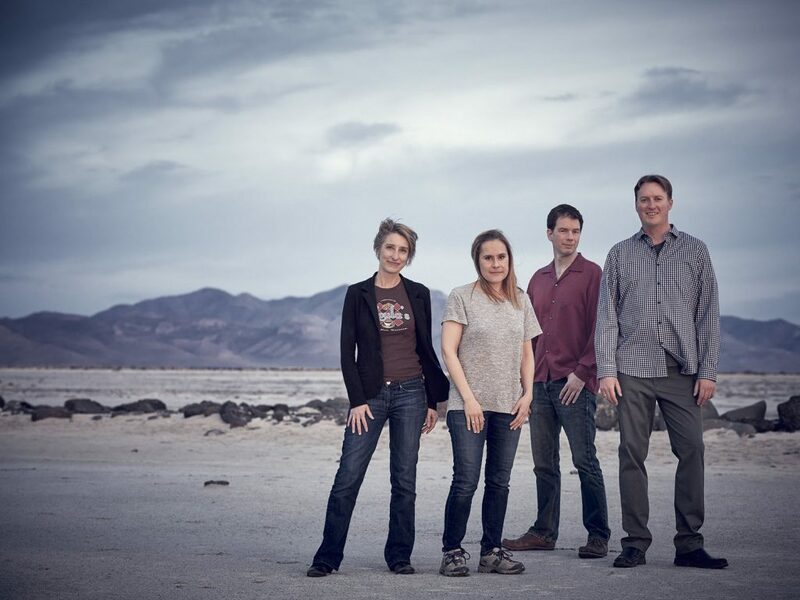 Recent seasons have included the multiple performances of Laura Kaminsky’s new chamber opera, As One (premiered at the Brooklyn Academy of Music with soprano Sasha Cooke and baritone Kelly Markgraff), as well as the premiere of Emergence by Libby Larsen, which anchors the Crossroads Project’s second chapter, Crossroads: Emergence for string quartet, film, and actor. The quartet’s significant touring history includes performances at major venues, festivals, and for distinguished series such as Carnegie Hall and the Schneider Series at the New School in New York, the Jewel Box series in Chicago, the Chautauqua Institution, Chamber Music Columbus, the Kravis Center in West Palm Beach, the DiBartolo Performing Arts Center at Notre Dame, the Theosophical Society in London, and the Mozart Gemeinde in Klagenfurt, Austria. 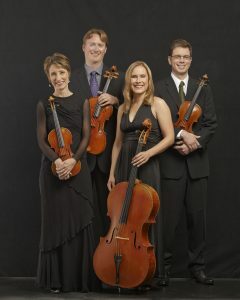 The quartet also enjoys a continuing residency with the Salt Lake City-based NOVA series. 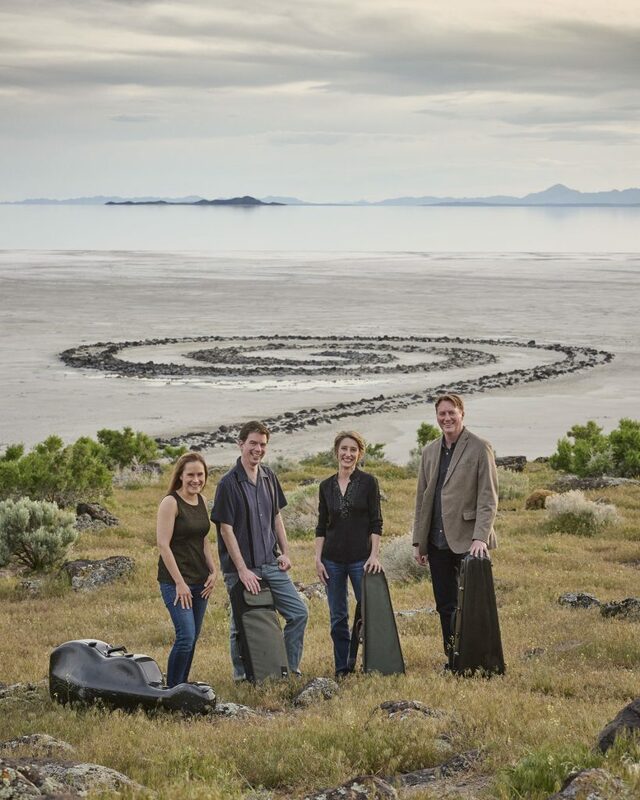 Projects have included the Schoenberg Chamber Symphony under the direction of Utah Symphony Music Director Thierry Fischer, the Utah premieres of string quartets by Michael Ellison and Andrew Norman, and frequent collaborations with members of the Utah Symphony. 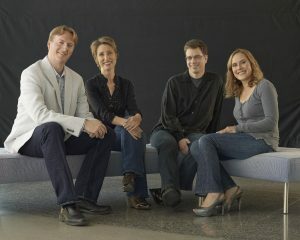 The Fry Street Quartet was founded in Chicago in 1997 under the mentorship of Marc Johnson, cellist of the Vermeer Quartet. (“Fry Street” was the location of the quartet’s first rehearsal space in the Chicago neighborhood once ruled by Al Capone.) Cultivating authentic and creative artistic voices alongside collaborative skills through chamber music is central to the quartet’s teaching. The Fry Street Quartet will perform the great Schubert two-cello quintet with acclaimed cellist Amit Peled during the 2020/21 season. Peled, cited by the American Record Guide as having “the flair of the young Rostropovich” will join the FSQ for selected dates. 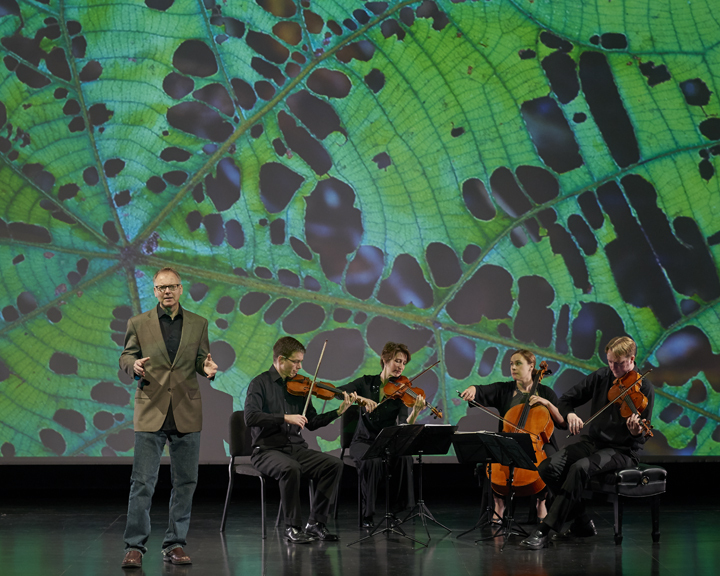 The Fry Street Quartet with physicist Robert Davies will bring Rising Tide: The Crossroads Project to the campus and community of Shepherd University in Shepherdstown, West Virginia. The performance on global sustainability and climate change issues is the first for Rising Tide in West Virginia and is followed by a performance at Longwood Gardens outside of Philadelphia. The Fry Street Quartet made its Chautauqua debut in two August performances: Baritone Kelly Markgraff joined the FSQ in Barber’s Dover Beach, alongside Haydn Quartet Op.76 No.1 and Bartok Quartet #5. The quartet then shared the stage with Markgraff and mezzo soprano Sasha Cooke for Laura Kaminsky’s acclaimed chamber opera AS ONE. Opera America, the trade association for 150 professional opera companies, cites “As One” the most produced new opera in North America.